In the case of Jesus Montero, I think we are now getting enough data to see what others may have missed. Players aren’t inducted for being versatile and sticking around into their mid-40s. Good thing Omar Vizquel can hit too. The last remaining player who made his debut in the 1980s, the 44-year-old shortstop could reach 3,000 hits if he sticks around a few more seasons. He also has won 11 Gold Gloves and has played every infield position. Assuming he plays until he’s 40, Johnny Damon, 37, could easily surpass 3,000 hits. Of the 28 players who have reached that threshold, 24 are Hall of Famers and two — Jeter and Craig Biggio — probably will be. Only the scandal-plagued Rafael Palmeiro and Pete Rose will likely be left out. Saints alive! Doy-El takes on El Santo! Voters from 1980, you were idiots. And you people didn’t get a lot smarter. Over time Santo received more support, but never enough to get into the Hall. Never close to enough. Needing 75 percent of the BBWAA votes to get in, he topped out at 43.1 percent in 1998, his offensive numbers from the pitching-dominated 1960s obscured by the cartoonish steroid era that was in full bloom in the late 1990s—and his defensive contributions simply ignored, I guess. The only one that maybe compared came when Blyleven was with Pittsburgh and threw a two-strike curve in St. Louis one day to catcher Terry Kennedy, who was a lefty, “and he swung at it at the last second, like he was chopping wood,” Blyleven recalls. “Thank goodness it was the last out, because it made everybody laugh, not only on our team, but on their team. whenever we use a skill-based metric like xFIP or SIERA….We are using a proxy for regression to the mean that doesn’t explicitly account for the amount of playing time a pitcher has had. We are, in essence, trusting in the formula to do the right amount of regression for us. And like using fly balls to predict home runs, the regression to the mean we see is a side effect, not anything intentional. Detroit Tigers broadcaster Rod Allen made an unfunny and inappropriate attempt at a joke about Latinos during Fox Sports Detroit’s telecast Thursday night. Allen, a color analyst since 2003, said the postgame meal in the Tigers clubhouse at Target Field should include rice and beans, because most of the team’s lineup against the Twins had Latino heritage. You see, the Latinos just love them some rice and beans, as the stereotype goes. Would Allen, who is African American, make a joke about a Tigers lineup that was mostly black requiring something stereotypical to eat? Would he stoop to make a watermelon joke? Maybe he would. Maybe he has. But that wouldn’t make it right, or funny. Frank McCourt loses round in bankruptcy court. Frank McCourt cannot use a loan he arranged to run the Dodgers for the rest of the season, a bankruptcy judge ruled Friday. The embattled Dodgers owner suffered a significant setback when he was ordered to negotiate with Major League Baseball for a loan. McCourt had argued he should not have to accept financing from Commissioner Bud Selig, who he feels is intent on stripping him of his ownership of the Dodgers. Pirates: Will they or won’t they?? The atmosphere should be electric this weekend when the Pirates host the St. Louis Cardinals in a three-game series between National League Central contenders that begins tonight at PNC Park. Only a few tickets remain for games tonight and Saturday night. Sunday afternoon’s series finale is also likely to sell out. There is no doubting that the Pirates are not only the hot story on the Pittsburgh sporting scene but in all of baseball as they continue to be surprise contenders following a run of 18 consecutive losing seasons. More posters have been revealed and this time for some interesting films. 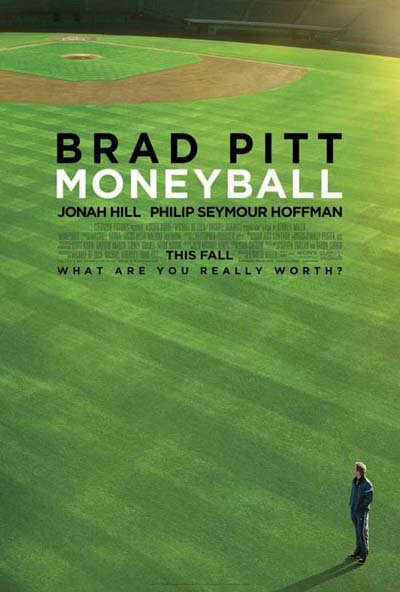 First off is the baseball dramedy MONEYBALL, starring Brad Pitt, Jonah Hill and Philip Seymour Hoffman and directed by Bennett Miller. Pitt stars as Billy Beane, the General Manager of the Oakland A’s back in 2002 most known for using a modern analytical system to draft players. The poster is actually pretty lame and reminds me a little too much of FIELD OF DREAMS. However, the basic point is made, as in the film is about baseball and Brad Pitt has some big dreams of sorts. Congrats to long time pal, Rich Lederer!...oh, and you too Blyleven. Sorry. Steve Hirdt says you didn’t produce enough RBI evidence. Nothing we can do about it. Tough (%$^!). Herm Krabbenhoft presented his findings to the Elias Sports Bureau, the official statistician for Major League Baseball, but thinks Elias hasn’t amended the record because Gehrig is an icon. But Steve Hirdt, executive vice president of Elias, says this particular case isn’t about protecting an icon. It’s about getting all the facts to make a decision with historical ramifications. Souhan: Bert Blyleven could be the final old-time Twin to get the Cooperstown call. 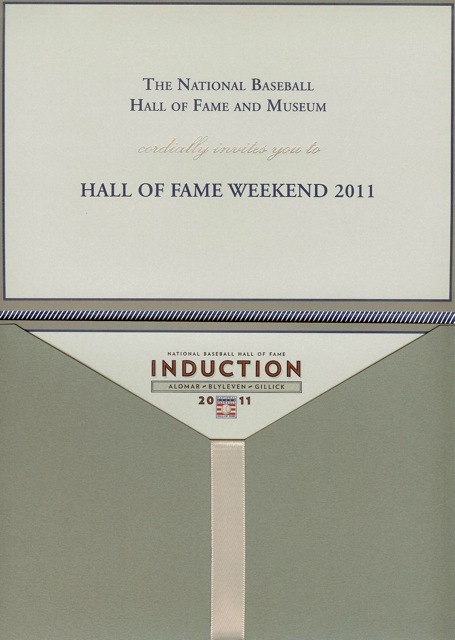 Sorry, I never actually read the complete “Dwight Siebler for the HOF!” petition pledge when I signed it. Bert Blyleven, entering the Hall of Fame at the advanced age of 60, will represent more than his body of work when he enters the Hall of Fame on Sunday. He will represent ghosts and friends, the injured and the ailing, the legacies of a foregone era. Blyleven chafed during the years he fell short of the Hall of Fame in the voting by the Baseball Writers Association of America. He got in, though, and he could be the last Twin who played at Metropolitan Stadium to make it to Cooperstown. Regina Morning Leader, July 22, 1911, immediately to the left of the linked article, Rube Waddell drops some early 20th century smack talk on…Toledo? Yep, Toledo. Of all places. Mr. Rube Waddell opines that there must have been some mistake about a Toledo fan assaulting [umpire] Gerald Hayes on a street car in the silent city. Talks are ongoing for a contract extension for Josh Beckett, who is scheduled to pitch the regular-season opener next Sunday night at Fenway Park against the New York Yankees.